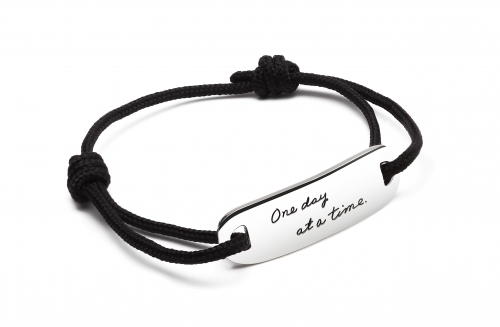 Delicate engraved handwriting graces this simply-elegant sterling silver bar that contains the inspirational mantra, “One day at a time.” When you give this gift, you give the gift of mindfulness. When the shining silver catches the eye, it’s a reminder to stop and enjoy the moment. This gift provides a gentle reminder to focus on the present because worrying about what has happened or what will happen wastes emotional energy. It’s a thoughtful present for anyone who is overwhelmed by life’s circumstances or struggling with anxiety. Scientists have proved that focusing on one thing, one day at a time increases happiness. Sterling Silver Bar 1 3/8” long x 3/8” high with adjustable cord.